The "Tophatters" of VF-14 from NAS Oceana fly the F-14A Tomcat and is the oldest US Navy squadron with a continuous history dating back to September 1919. They received their latest aircraft in January 1973, replacing the F-4B Phantoms. 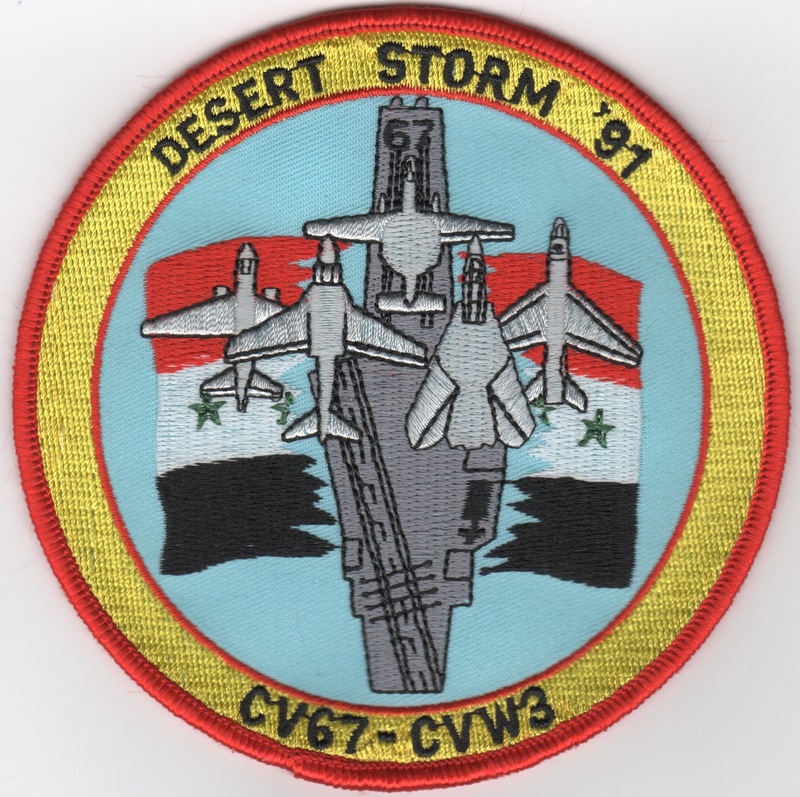 This patch is their 1991 Desert Storm Cruise patch while onboard the USS JFK (CV-67). 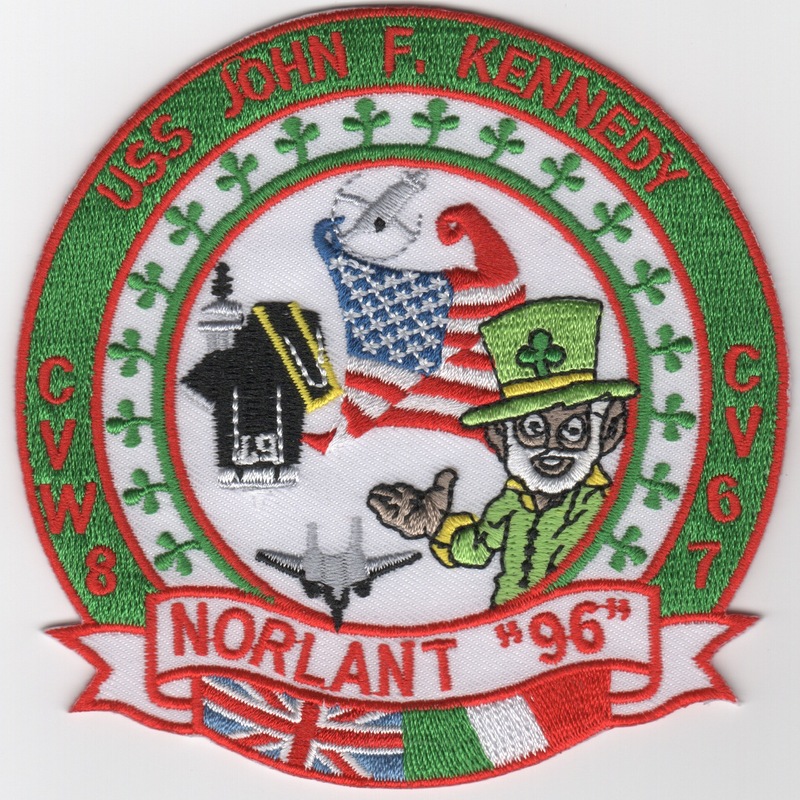 This is the cruise patch for CV-67 and CVW-8 for their 1996 NORLANT (North Atlantic) cruise. It shows a leprechaun in the middle with the US and Irish Flags along the bottom. This patch does not have velcro attached. This is HS-3's Cruise patch while they were attached to CVW-3 onboard the USS John F. Kennedy during their '97 Med Cruise. This is the USS John F. Kennedy ("Big John"), '97 Med and Persian Gulf Cruise Patch. Attached squadrons were VF-14, VF-41, VFA-15, VFA-87, VAQ-141, VAW-124, VS-24, VQ-6, and HS-3. She is one of only two non-nuclear carrier in the US Navy's inventory. This is the yellow, round, "gaggle" version of one of the USS John F. Kennedy '97 Med and Persian Gulf Cruise Patches. Attached squadrons were VF-14, VF-41, VFA-15, VFA-87, VAQ-141, VAW-124, VS-24, VQ-6, and HS-3. She is one of only two non-nuclear carrier in the US Navy's inventory. This patch was created for VFA-136 for their '01/'02 cruise onboard the USS JFK (CV-67) for their participation in Operation Enduring Freedom. It is very similar to VF-213's OEF Cruise patch also. The USS John F. Kennedy and VAW-123 made this Millenium Cruise patch. They are attached to CVW-1 and did this cruise in late '99 to early '00. This was the Operation Desert Storm cruise patch for the USS John F. Kennedy and Carrier Air Wing 3 in 1990. Operating out of the Red Sea, they flew many combat missions over the Sinai Peninsula to attack targets. Nice job. This was part of CV-67's 1990 cruise with CVW-3 before sailing to the Red Sea for the buildup of Desert Storm. This cruise patch was also part of CV-67's 1990 cruise with CVW-3 before sailing to the Red Sea for the of Desert Storm. 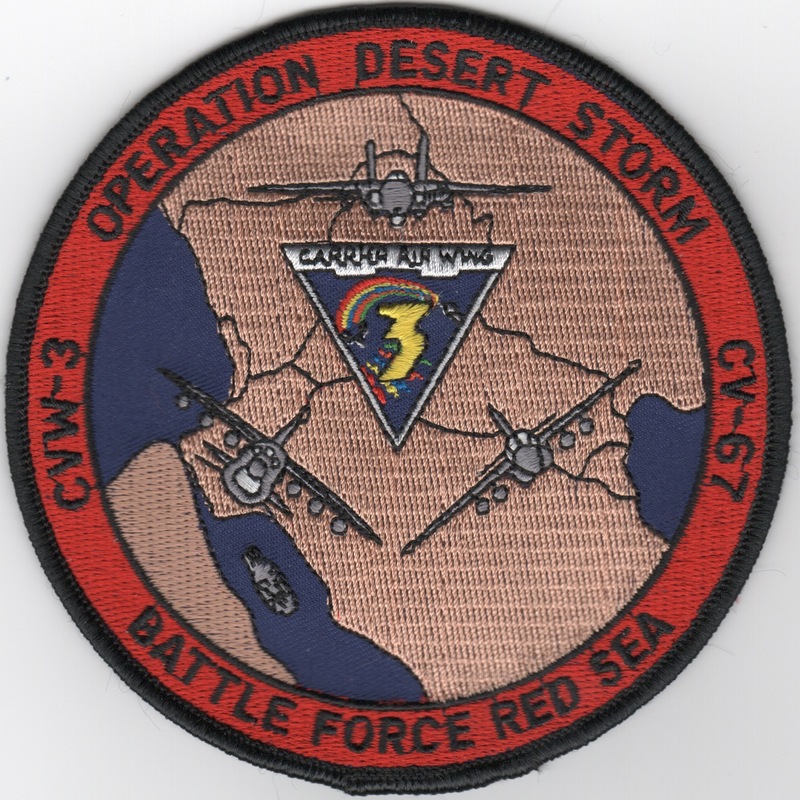 This cruise patch was also part of CV-67's 1990 cruise with CVW-3 before sailing to the Red Sea for the of Desert Storm. It shows Airwing 3 sailing through the Iraqi Flag. 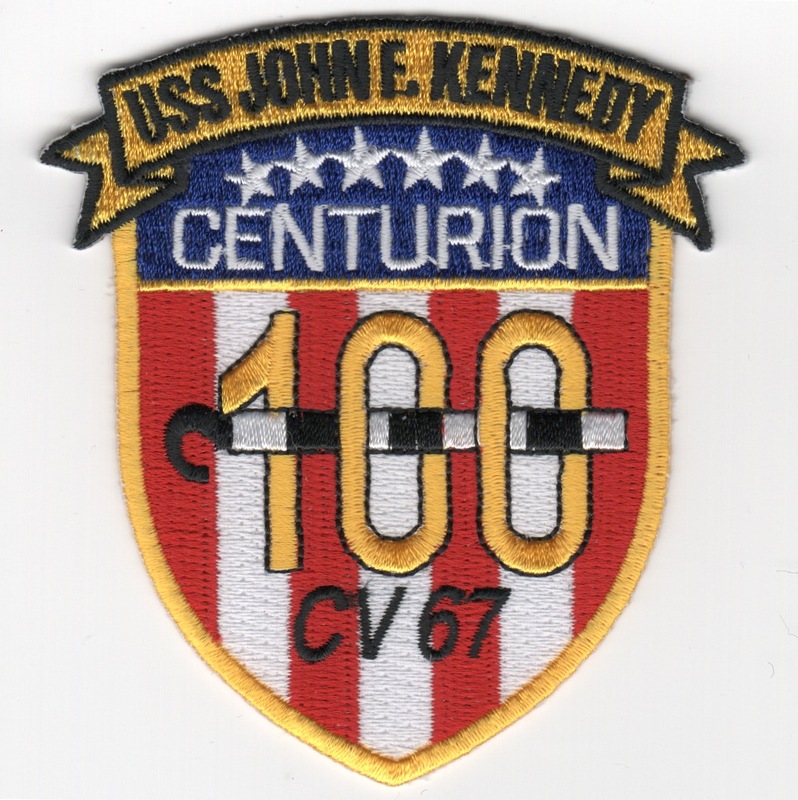 This is the 100 traps "Centurion" patch created by USS John F. Kennedy (CV-67). This patch is awarded to those aviators who land on this particular boat that many times......pretty prestigious accomplishment. This patch does not have velcro attached. 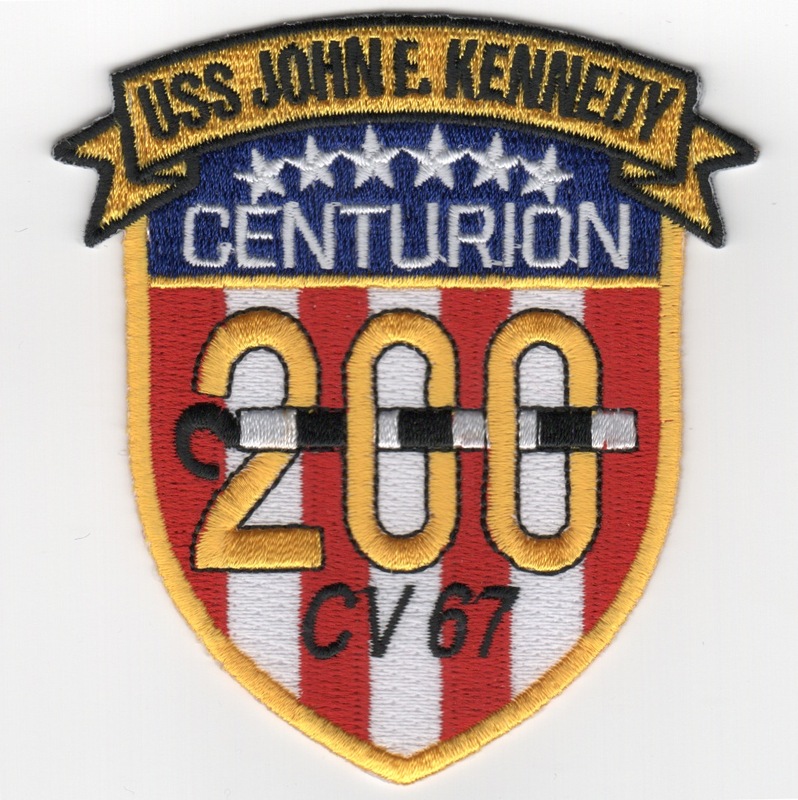 This is the 200 traps "Centurion" patch created by USS John F. Kennedy (CV-67). This patch is awarded to those aviators who land on this particular boat that many times......pretty prestigious accomplishment. This patch does not have velcro attached. 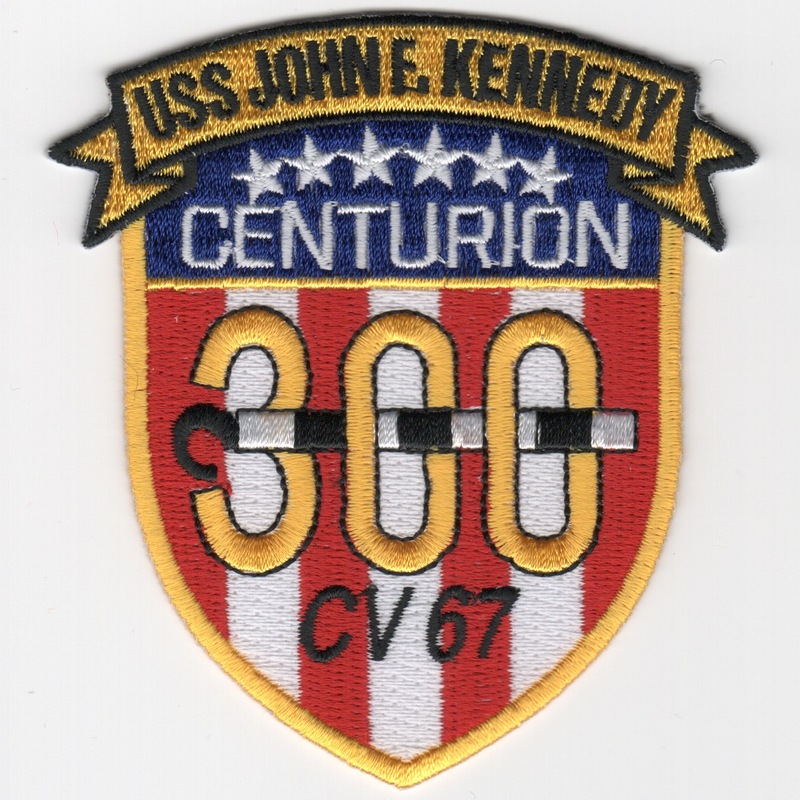 This is the 300 traps "Centurion" patch created by USS John F. Kennedy (CV-67). This patch is awarded to those aviators who land on this particular boat that many times......pretty prestigious accomplishment. This patch does not have velcro attached. 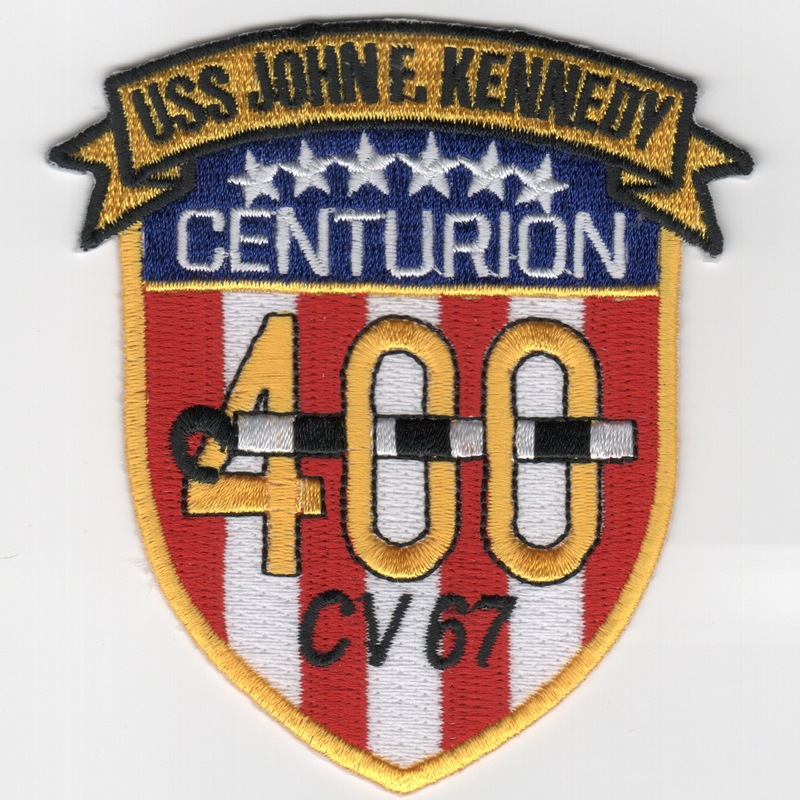 This is the 400 traps "Centurion" patch created by USS John F. Kennedy (CV-67). This patch is awarded to those aviators who land on this particular boat that many times......pretty prestigious accomplishment. This patch does not have velcro attached. 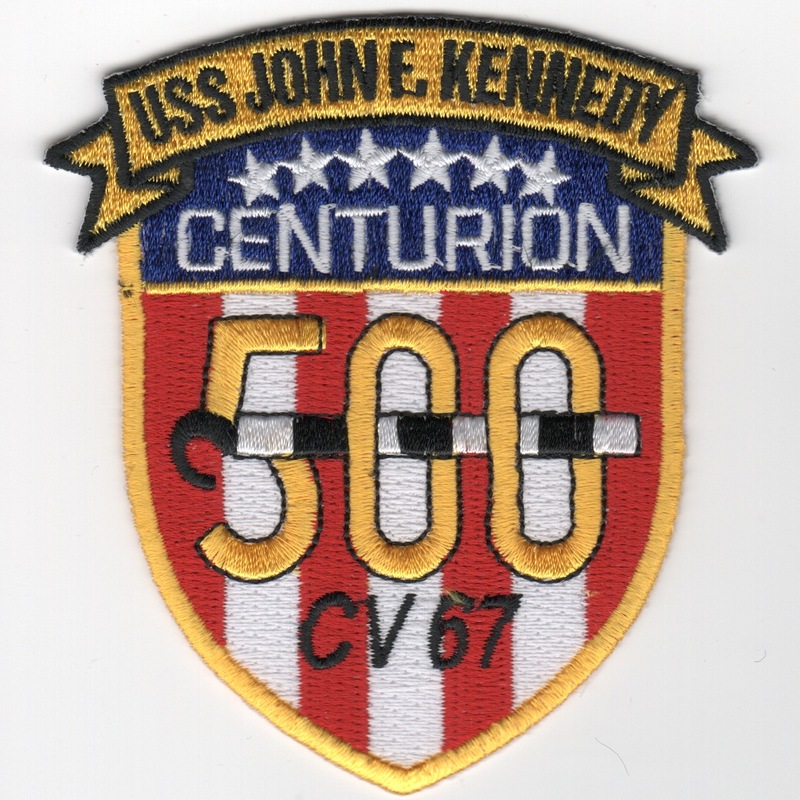 This is the 500 traps "Centurion" patch created by USS John F. Kennedy (CV-67). This patch is awarded to those aviators who land on this particular boat that many times......pretty prestigious accomplishment. This patch does not have velcro attached. Use this link to get all FIVE of the centurion patches for the JFK. Homepage | Order CV-67 Cruise Patches!